The search found 21 results in 0.118 seconds. The United States, by far, spends the greatest amount on military (in nominal terms) than any other country. The defense share of the federal budget has averaged 21 percent over the past two decades. How does our debt affect America's foreign policy? 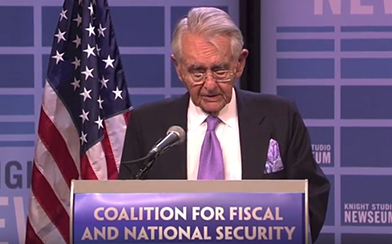 During the 2012 presidential debates, voters concerned with our nation's growing debt and deficits must listen closely for how the candidates' foreign policy plans will influence America's long-term fiscal path and national security. Budget Basics: How Does Our Debt Affect America's Foreign Policy? During the final debates, it's up to us to pay attention to how our presidential candidates’ plans could impact America's future. 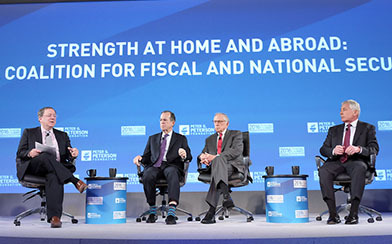 While the budget and economy were already major topics, the upcoming debates will highlight national security and a range of other issues — both foreign and domestic — that also have implications for our long-term fiscal health. As policymakers consider how best to address our looming fiscal challenges, there is a growing debate about whether the U.S. can reduce defense spending without jeopardizing its national security. Press event announcing the Coalition for Fiscal and National Security, held Tuesday, December 4, 2012 at the Newseum in Washington DC. Our fiscal goal must be to stabilize the debt as a share of the economy, and put it on a downward path for the longer term. The report finds that the President's proposal fully incorporates 12 of the DAC's 27 recommendations and partially incorporates another nine. 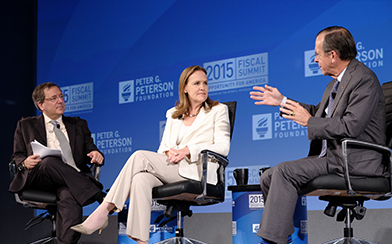 Two of America's most respected defense experts discussed the connection between our nation's fiscal strength and national security. New York Times national security correspondent David Sanger leads a discussion among members of the Coalition for Fiscal and National Security.